Fleming H. Revell Company, 9780800720469, 325pp. It is August 1944 and Paris is on the cusp of liberation. As the soldiers of the Third Reich flee the Allied advance, they ravage the country, stealing countless pieces of art. Reichsmarschall Hermann Goring will stop at nothing to claim the most valuable one of all, the Mona Lisa, as a post-war bargaining chip to get him to South America. Can Swiss OSS agents Gabi Mueller and Eric Hofstadler rescue DaVinci's masterpiece before it falls into German hands? 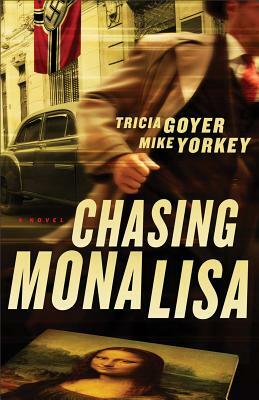 With nonstop action, "Chasing Mona Lisa" is sure to get readers' adrenaline pumping as they join the chase to save the most famous painting in the world. From war-ravaged Paris to a posh country chateau, the race is on--and the runners are playing for keeps. Tricia Goyer is the coauthor of "The Swiss Courier" as well as the author of many other books, including "Night Song" and "Dawn of a Thousand Nights," both past winners of the ACFW's Book of the Year Award for Long Historical Romance. Goyer lives with her family in Arkansas. Mike Yorkey is the author or coauthor of dozens of books, including "The Swiss Courier" and the bestselling Every Man's Battle series. Married to a Swiss native, Yorkey lived in Switzerland for 18 months. He and his family currently reside in California.